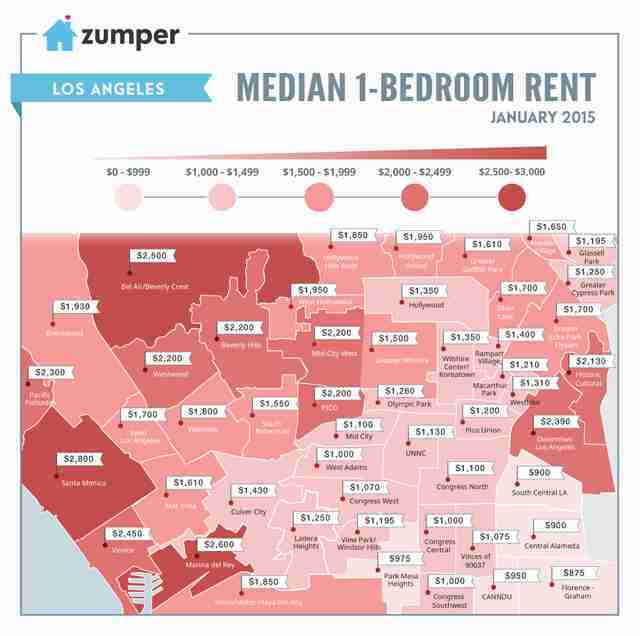 Bad news, LA: seems like the rent is getting higher and higher, according to new data from listings site Zumper. Think your rent in Silver Lake is outrageous? Well, thanks to a new map from the site, you can get a good look at the stupidly-high rents people are paying across the city. 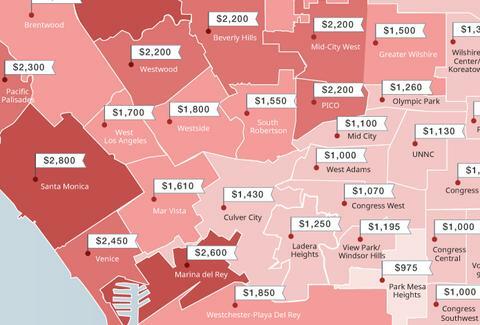 The map shows just how expensive neighborhoods around the city are, based on Zumper's data from the last couple of months. Specifically, the maps show the median rents per neighborhood for a 1-bedroom apartment from January. Unsurprisingly, rents were the highest in Santa Monica, Marina del Rey, and Bel Air -- with the median prices pushing close to $3,000. But the neighborhoods that saw the biggest increases were West Hollywood (up 5.4% to $1,950), Westwood, which saw prices go up almost 5% to $2,200, and Hollywood United -- the weirdly-pieced-together section of hills above Hollywood proper, which saw prices jump up 8.3% to $1,950, according to Zumper. However, prices went down a bit in Brentwood and Pacific Palisades. Tony Merevick is Cities News Editor at Thrillist and lives in NYC, where the rent is even higher. Much higher. Follow him on Twitter @tonymerevick.